I've been pinning away all night and have found some GREAT resources for my unit on characteristics of matter which was supposed to begin today but, since it was the first day back and all, that didn't happen. BUT tomorrow... it WILL happen! We're going to start off the day sorting bags of stuff. Just random stuff. Then talking about why we sorted it the way we sorted it. Which will lead into a fun activity where we'll get to chew gum. In. School. As shock rings out across the classroom, they'll be documenting the properties of the gum using their senses. Next, some fun videos from United Streaming. 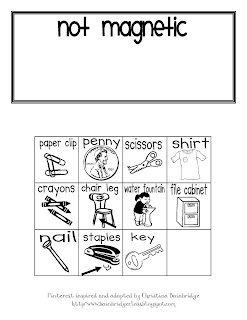 We're going to make hands to help us remember texture words. On each finger will be one of the following: the word BUMPY with some beans, ROUGH with sandpaper, SMOOTH with waxed paper, SOFT with cotton, and HARD with macaroni. This was also from Pinterest, but now I can't find it and I forgot to pin it. For which I made this freebie to share... thanks for the start, Mrs. Richardson! My kiddos will have to draw their own "thing" in the last box and then glue it to the appropriate area- magnetic or not magnetic. and solids, liquids, and gases flippy too! 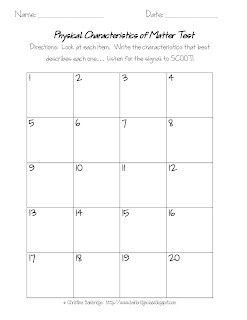 And to wrap it up, we'll be taking our assessment by playing a "SCOOT" style test game where students identify characteristics of an object, jot a word on a piece of paper, and then move at the signal to the next desk. You can grab it for free! This will all lead in well to the 2nd grade idea of mixtures and solutions. Phew! That was a lot of science! I hope you enjoy the freebies and... thanks, Pinterest, for the great ideas tonight! I LOVE the idea of taking an assessment scoot style! You are so amazing and so generous!! We've already done matter this year, but I will totally save this all and use it next year. Love the scoot assessment idea!! Thank you, thank you, thank you!!!! You have to go here http://teacher.scholastic.com/activities/studyjams/matter_states/ and use this solids, liquids & gas song. Give it a chance and the kiddos will be addicted to it! Did I get the updated matter flippy when I won your giveaway?? I had never heard of SCOOT until last week, and it sounds wonderful. I tried it today with my 1st graders and...well...not so great. Any tips on modeling it to make the game go more smoothly? Mrs. M- I love "SCOOT" and use it often in my 1st/2nd grade class. I have my kids hold their pencils up after they write and, when most are done, we ding the bell and go to the next station. The first few times we did it, we had partners and that worked out well as I paired up my firsties with 2nd graders who were more capable. Love these matter and magnets ideas! Thanks for sharing!